With Board & Train, your dog stays with us at our facility for a recommended minimum of two months. We complete an initial assessment and create, with your assistance, a training plan tailored to you and your dog's requirements - whether it be for basic training or behaviour modification. For many owners, Board & Train is a practical way for their dog to receive the training they need. Many owners are not equipped to train their dog effectively or are short on time (or patience) to train with their dog but love to spend time taking them for a walk, run or bike ride. There are no guarantees that the dog will continue to do the behaviours learned after they are home and back to old routines. Dogs do not easily generalize behaviours, but that does not mean they do not know them once taught. This simply means that because they can do the behaviours in one environment or with one person, does not mean they will do it in any environment or with any person. Follow-up sessions are highly recommended to have continual progress. Your dog is trained, using reward based training philosophy, in all types of practical and real-life situations both inside and outside. Your dog is worked around people, other dogs and in many different environments. Visits are scheduled for you and your family to come in and learn to work under our supervision. 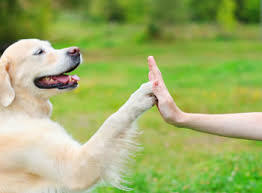 We will teach you about canine body language and teach you the same methods we use in training your dog. Working with you helps the new appropriate and wanted behaviours will transfer to your environment. What can you expect from our Board & Train program? Your dog will be taught the cues on the Word List. Dogs may leave with varying understanding of the cues because not all dogs learn the same or at the same rate. It is also dependent on how long your dog was with us. You will be expected to attend private training sessions to learn what your dog is learning or has learned. The visits will depend upon speed of progress and your availability. Once you take your dog home, we do not stop helping you. We do require one follow-up visit after you take your dog home. We also support you for the lifetime of the dog because a dog's behaviour can change throughout their entire life. Outings help dogs generalize behaviour. It takes approximately 16 environments to generalize a behaviour! We take your dog to parks, roads, fields and stores to help with generalization. Exercise is a huge part of owning a dog and we believe it is crucial to the physical, behavioural and mental health of dogs. Your dog will be exercised using activities based on their age and abilities. This could include walks, biking, running or socializing with dogs of similar playing abilities and styles. There are a limited number of dogs we can take at a time for Board & Train to ensure all the dogs get the appropriate amount of training and exercise per day. You will want to book in advance to ensure you have a spot. to book and confirm a spot, pick-up or drop-off. High risk dogs (regular daycare, traveling and dog park dogs) are recommended to also have Bordetellosis and Leptospirosis. My own dogs receive the core vaccinations on schedule with both Bordetellosis (every 6 months) and Leptospirosis (yearly) and parasite control (monthly) to keep them safe and healthy. These requirements are to keep all humans and dogs safe because your dog's health and safety is very important to us.